Clover is the most popular of all the honeys. Clover honey varies in color from Water whites to extra light amber and has a mild sweet, delicate flavor. A darker more robust flavor comes from the aster and goldenrod flowers in the Fall. Great for cooking. Ordering please list what kind you would like. This is a unique type of honey once enjoyed by our grandparents that is now being Rediscovered! 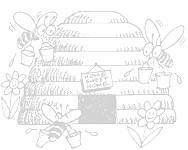 It is honey that remains in the wax combs, just as the bees have stored It. Comb honey tastes great, wax and all. Since the bees have sealed it in wax, the Honey keeps its entire original flavor. These Dips are great, just cover cream cheese with them and spread on your favorite cracker. Out of this world GOOOOD! collects the sap in buckets and boil it down using a traditional wood fire. 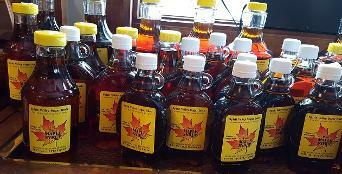 Maple Syrup is excellent on pancakes, waffles, toast, vanilla ice cream, etc. much as I enjoy making it.